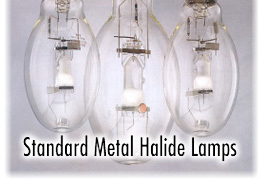 Venture offers the widest range of standard metal halide products, including North American and European style lamps. With over twenty years of experience, Venture's high quality lamps are used worldwide. This section provides complete data for North American medium and mogul base 175W, 250W, 400W, 1000W, 1500W and 1650W standard metal halide lamps. Product Number Lamp Description Bulb Shape Base Type Bulb Finish Operating Position Initial Lumens Rated Life Hours Corr. Lamp Description Bulb Shape Base Type Bulb Finish Operating Position Initial Lumens Rate Life Hours Corr.